When ever I view your webpage and it's animations, the axiom "standing on the shoulder of giants" goes through my mind over and over. Your animations helps me to understand the concept practically, and it's also make me curious to learn. Thank you for providing these animations. Wouldn't the drum be rotating at a 3:1 ratio, not a 2:1? 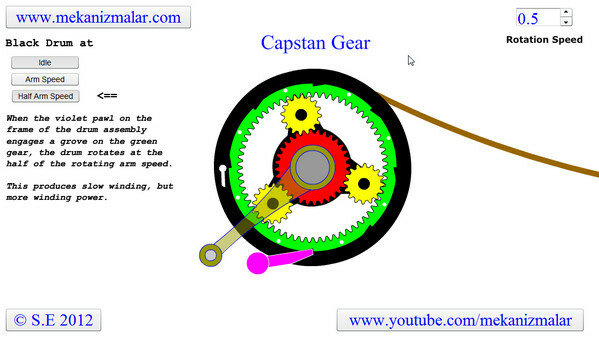 The ring gear has 64 teeth and the sun gear has 32 so 32 / (64+32) = 1/3. Excellent animations though. Dear Rich, Thank you for your visit to my web page and excellent correction you have made. Yes, every three rotations of the arm the drum makes only one rotation.